End of Year Summer Party 2016! The famous End of Year Summer Party is back again on Friday 27th May 2016! Just a quick note to all Arsenal fans out there that we are TOTALLY SOLD OUT for Saturday’s FA Cup showing. There will be no tickets on the door. If you have got a ticket please note we will be open from midday and expect the best seats to go fast so get down early! Fellow students, exam time is upon us! But don’t despair, there is light at the end of the tunnel! We have scheduled an end of year event to bring everyone at Uni together one last time this year, to celebrate the end of exams, the start of the summer, and to see your Uni friends for one last big blast before everyone goes home for the holidays. The End of Year Summer Party is for all our London Met students and friends, whether student or non-student… a great chance to celebrate with them before saying good bye for the Summer, with tons of entertainment, food and drink, and we want you all to come, to have a huge London Met party before the hols start!!!! It’s on Friday 30th May, 8pm – 2am. At our great London Met venue ‘The Rocket Complex’. We have a Tropical theme with Carribean BBQ, Pina Colada bar, steel drums and Tropical DJs in our wonderful courtyard. Create some precious memories with our amazing FREE photobooth – with fun props and free prints on the night for you and your friends! Live Party Band & DJs on rotation all night!!!! Dress code is just ‘dress to impress’ – anything goes but we know you’ll be wearing your fanciest threads. As always keep up to date with the latest info via our twitter @londonmetevents and our FB (see link above). Summer Party and Happy Easter! 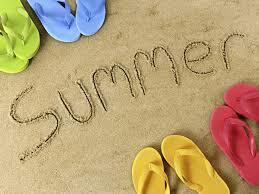 Hope you enjoyed the sun at the weekend! So end of term has been and gone last Friday, and we had a great time celebrating it with you. Check our facebook later today for all the pictures! We’ve got more in store for you, as always facebook and twitter are the best places for all the details, but here’s some info below too! Pre-exams End of Freedon Party! As last year’s ‘pre-exam party’ was so good, we’re running another one! Come celebrate with us and your mates on Friday 9th May, just before exams start. Free entry, good music from 3pm and amazing drinks deals so you can party one last time before getting down to business! See all the details on our facebook here. 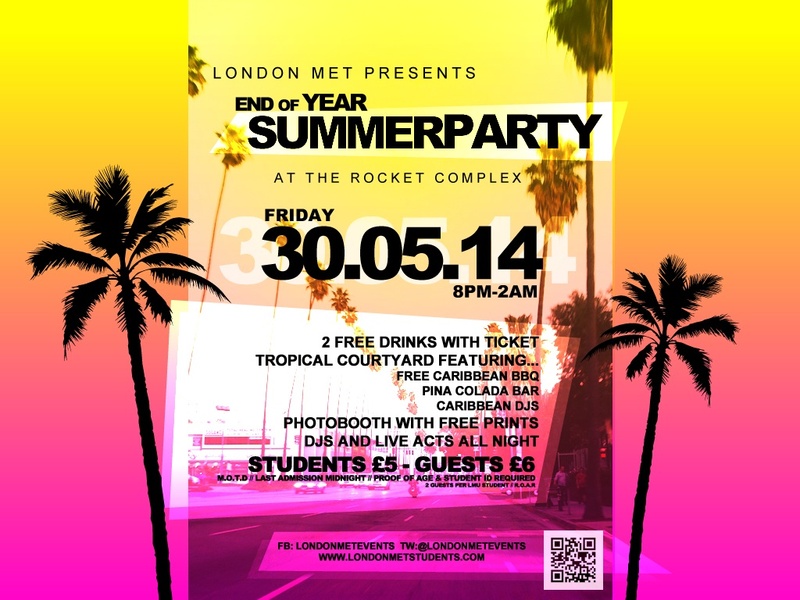 We’ve released the date for the End of Year Summer Party, it’s going to be on Friday 30th May at The Rocket Complex! It will be the best time to say goodbye to uni friends for the Summer, and celebrate the start of some well deserved (and hopefully sunny) time off!!! This will be a highlight event of the year… with the usual food, drink and DJs, and various cool entertainment. See facebook for all the details as they appear! Tickets will be released after Easter and available online then too. End of Year Summer Party!! Celebrating the end of exams and the start of Summer! 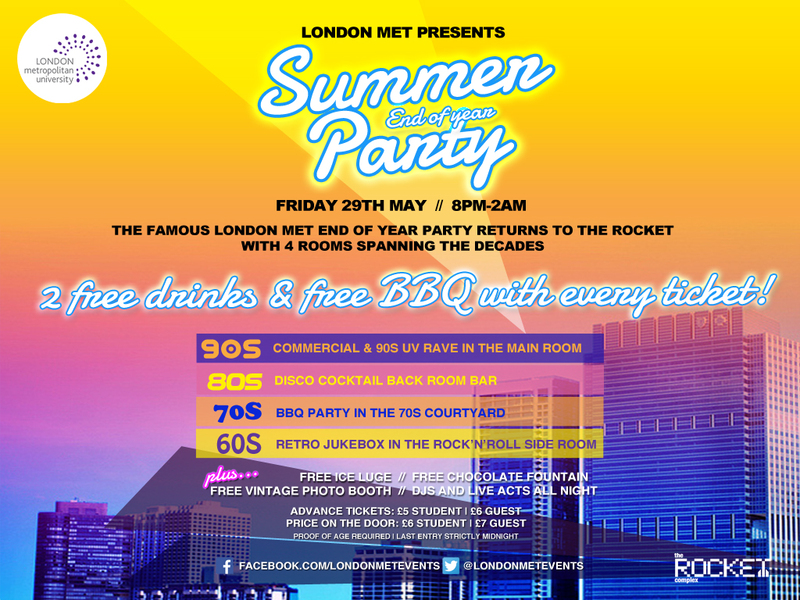 The end of year party is for all our London Met students and your friends whether student or non-student, a great chance to celebrate with them before saying good bye for the Summer, and we want you all to come, to have a huge London Met party before the hols start!!!! It’s on Friday 31st May, 8pm – 2am. Included in the ticket price is a FREE BBQ and 2 x FREE DRINKS!!! 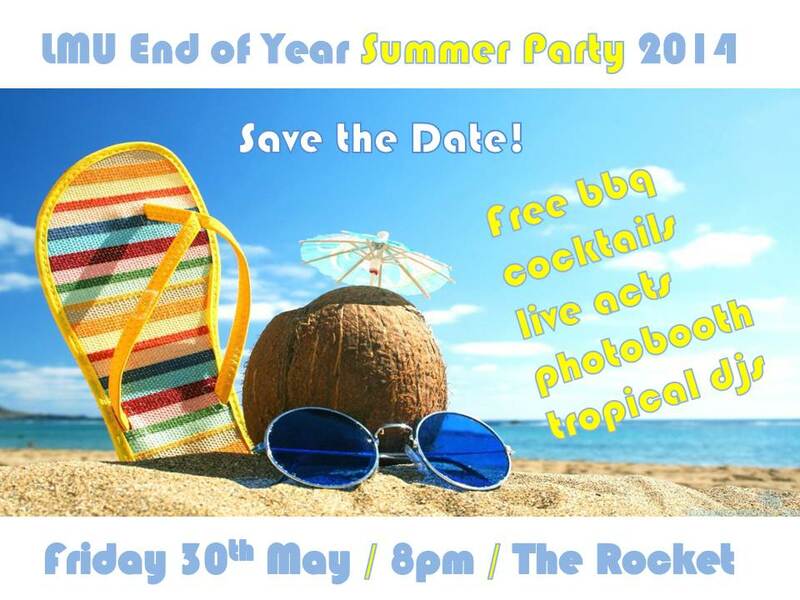 Summer comes to the Rocket Courtyard with a free jerk BBQ, steel band, pina colada bar and reggae DJs. Create some precious memories with our amazing FREE London Black Cab photobooth – with fun props and free prints on the night for you and your friends! We’re upping the fun with a VODKA ICE LUGE and a CHOCOLATE FOUNTAIN too! Live Party Band & DJs on rotation all night! More entertainment and acts to be announced!!!! You can get your tickets from the Rocket Complex bar or shop, or click below to buy your tickets online! Hurry and get them before it sells out! !